Are you planning on a filing system conversion ? File Label Express is your partner in fast and professional delivery of high quality file labels, Extenda Tabs or new folders with new labels. 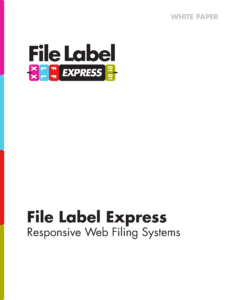 Whether you’d like to replace worn-out labels or move to a high-density filing space, File Label Express is the cost-effective solution for your file system conversion project. Our secret to success is in our color-coded label system. We take your existing or compiled file data and re-label your files with color-coded strip labels. Our “line sight” color labels are effectively placed on the side, or side tab, of a folder and can dramatically reduce retrieval times by up to 40%. Together, these colorful side-tabs are more effective for management than their “top tab” predecessor. Our service center has the capacity to print and package as many as 30,000 high-quality, color-coded labels a day. We can provide your labels ready to apply!